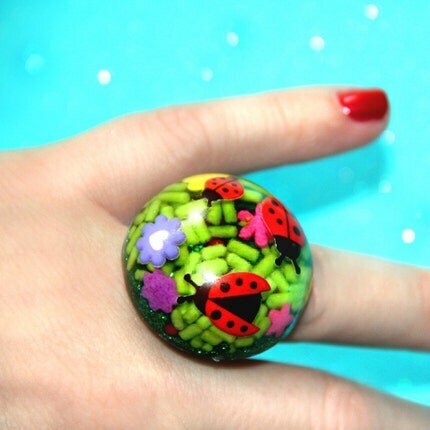 This fun & fabulous whimsical cute ladybugs giant domed ring is loaded with a bunch of ladybugs, flowers, sprinkles and glitter...all handcast in a smooth dome of clear shiny resin. It looks like an imaginary miniature world where ladybugs come to play on sugary grasses & stop to smell the flowers. So fun...and an excellent summertime accessory! Folksy :: Buy "Candy Ring"